Yesterday, Ohio State, which was ranked #3 in the AP top 25 poll and #6 in the CFP rankings, lost to Iowa. Not #14 (#15 CFP) Iowa State, but Iowa. They just didn't lose to the unranked Hawkeyes, they were trounced. This means Ohio State is going to be dropping a lot in both the AP poll and the CFP rankings (which come out Tuesday). Which is good news for every team ranked below them, including the University of Washington Huskies. Last night the Huskies took on the Oregon Ducks in a rainy game at Husky Stadium. Oregon took the kickoff to start the game and then managed to march down the field. The Husky defense held them to a field goal, putting them on the board first at 3-0. Then the Huskies marched down the field, but got held to a field goal attempt. Place kicker Viscano tried and missed. This was the nadir of the game. The Ducks never scored again. Dante Pettis made his 8th career runback for a touchdown from a punt, making him the NCAA all time record holder for that accomplishment. From then on out, the Huskies dominated the hapless Ducks, who often just went three and out when they had the ball. A fake reverse got the Huskies seven more points. When the score was 38 - 3 and there was about 9 minutes left in the game, Husky coach Chris Petersen, as he does, started rotating backup players into the game. Even then, the Ducks couldn't score (even though they could move the ball better). The final score was 38 - 3. The missed field goal denied us a 40+ score, something I think is needed to impress the voters of the AP poll and the CFP committee. bad for the Huskies. It's good because now the Dawgs are securely in the top spot of the Pac-12 North with an 8-1 record (5-1 in conference). The Cougars are number two at 8-2 overall, 5-2 in conference. And Stanford is at number three with a 6-3 overall and 5-2 in conference. But it's bad because this will probably drop Stanford out of the AP and CFP top 25, meaning next week's game when the Huskies travel to Palo Alto to play the Cardinal, Stanford won't be ranked. And the Huskies will still not have played a ranked team. That will have to wait until the Apple Cup the Saturday after Thanksgiving (assuming the Cougs don't "Coug it" in their game against Utah next week. their last game before the Apple Cup). In the Pac-12 South, after defeating the Arizona Wildcats, USC is firmly in control and will probably be the Pac-12 South winner with an 8-2 overall and 6-1 in conference record. If Washington doesn't lose any more games and beats USC in the Pac-12 championship game, they might have a chance at a playoff spot. But this year the competition is so strong, it seems unlikely. Washington's strength of schedule (or lack thereof) will hurt them with the committee. Sure, Ohio State is out, but you have powerhouses such as Alabama (who Washington lost to last year in the playoffs), Georgia, Notre Dame, and Clemson currently in the top four positions. Alabama and Georgia are undefeated. I don't see that list changing unless one of the top four has an upset loss. Washington should move up with Ohio State's loss, but I don't see them getting into the top four slots anytime this season, which is where you have to be to be in the playoffs. The CFP doesn't come out until Tuesday. But the AP top 25 poll comes out at 2 PM EST (11 AM PST) today (Sunday). Ohio State dropped from #3 to #11. Washington went from #12 to #9, putting them back in the top 10. 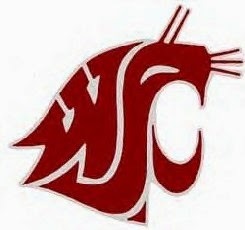 USC went from #17 to #15, and WSU went from #25 to #19. And Stanford dropped out of the top 25. Arizona also dropped out of the top 25 after being ranked for one whole week. It'll be interesting to see what happens Tuesday with the CFP rankings.